As readers of my blog probably know, I’m in the process of planning a wedding. It’s coming up, too! 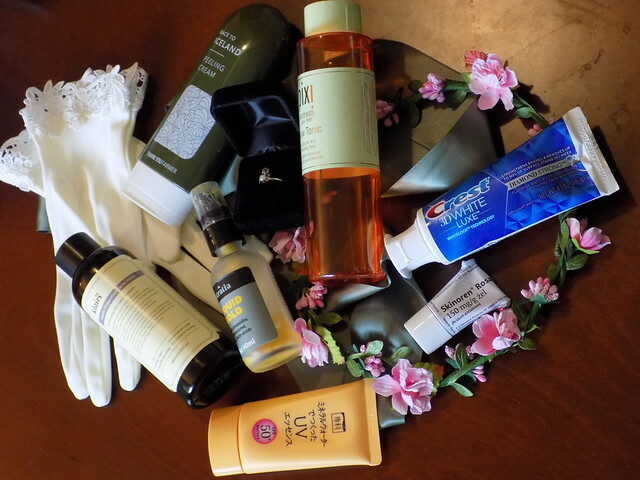 Of course, every bride I’ve ever seen has looked radiant and beautiful on her wedding day, but I definitely want to do everything I can to help the “wedding glow.” As an avid follower of skin care technologies, I’m constantly seeing people talk about pre-wedding beauty and ask what skin care products they should be using to get their skin ready for a wedding. So I thought I’d take a bit of time to talk a bit about my beauty treatments leading up to the wedding, and why I’ve chosen what I’ve chosen. Here are my top seven strategies for preparing for my wedding. This is rule one, guys. Nothing new, less chance for an unexpected reaction that I’m frantically trying to deal with the week before the wedding. I have made minor exceptions for one-time-use products that I’ve checked ingredients very carefully, but I added my last long-term-use product one month before the big day. If you’re not like me and have over a year to prepare, start as soon as possible to get a good skin care foundation. I’ve written a bit about it here, but this post is also a great treatment of the hierarchy of what to worry about when you first start overhauling your skin care. Personally, I started my most recent skin care journey over a year ago, and one year is about when I started seeing a major difference in the resilience of my skin. While I’ve been using chemical exfoliants for a while, I had stopped using much in the way of physical exfoliation since I started down my science-based skin care road. But lately, I’ve found that my skin gets a little… off-feeling at times. So I started experimenting with physical exfoliation for times when I wanted my skin to be an extra-nice canvas for makeup. I also still use my azelaic acid three times a week. Plus, I’ve been loving Pixi Glow Tonic, a gentle glycolic acid toner that also has ginseng and horse chestnut extracts, which are both shown to improve skin brightness. I drink lots of water and I use sunscreen every day, rain or shine. You know what’s a good way to avoid wonky tan lines? Sunscreen. A good way to avoid dehydrating your skin and looking dull on your wedding day? Sunscreen. Sunscreen is the best aging preventative and the best skin damage preventative, so, yeah, I use sunscreen every day. Plus, I’m using exfoliants, so it’s extra-necessary. And drinking plenty of water and trying to keep up a healthy lifestyle helps keep stress in check, which in turn comes full circle to prevent stress-induced breakouts. By this, I mean, remember that your body and your smile need love, too. I realized that my love of tea has left me with a decidedly British tooth shade, so I bought a tube of whitening, strengthening toothpaste to try to remove some of the stains. For my body, since my dress has a low back, I’m making sure to use moisturizing and exfoliating lotions there, too (as well as regular sunscreen!). I’ve also started working on taking better care of my nails, keeping them trimmed and filed, moisturizing them, and using a strengthening treatment to seal in moisture and prevent splitting. I am doing my own hair and makeup because I’m having a low-key wedding, but even if you’re not, it’s not a bad idea to make sure you know what your face looks like with slightly heavier makeup. It’s good to go into an event knowing what you like yourself to look like. I’m actually doing a slightly heavier version of my head shot makeup look for the wedding, since I know what it looks like on me and I’ll still feel like myself. I also practiced my hair so I would know what to tell the woman making my custom birdcage veil. Right after I got engaged, I realized I was still struggling with breakouts more than I wished I was, so I joined Curology. There, I learned about my personal skin care game-changers and had the benefit of some professional advice. While I haven’t felt it useful to continue my subscription, I certainly wouldn’t be where I am today without it. So there you have it, my seven strategies for preparing for a day when I will be gawked at and photographed more than probably any other day in my life (and certainly from closer up than when I’m on stage!). I hope some of my efforts will help inspire you to make your own plan of attack for big-day beauty. Thanks, congratulations to you, too! “British tooth shade”, really? I like your blog a lot but that kind of stereotyping is unnecessary and leaves a bad taste. I apologize. It was an unnecessary, tongue-in-cheek comment. For what it’s worth, I was mostly referring to the stains that love of tea seem to leave, which seems like a very British problem. I’m actually honeymooning in Scotland and looking forward to visiting such a beautiful country!